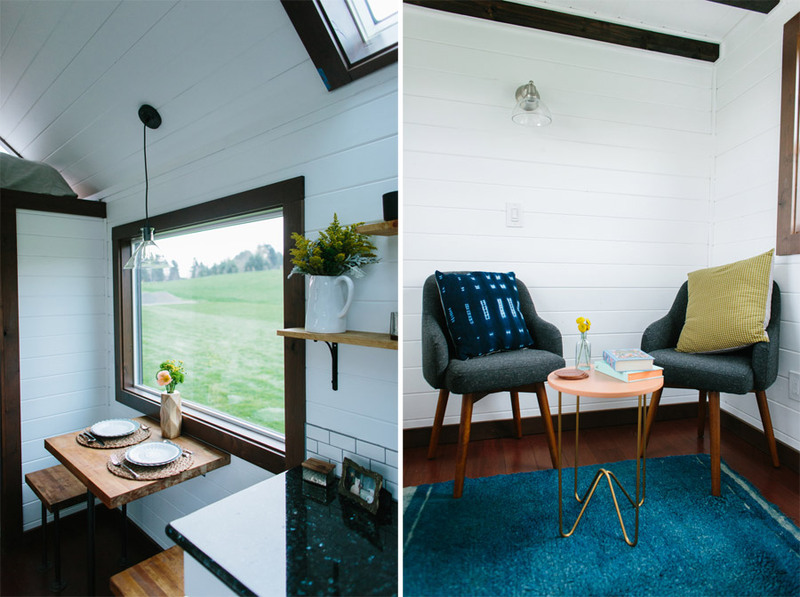 A luxury tiny house on wheels in Portland, Oregon. Built by Tiny Heirloom. Awesome tiny house!!! LOVE IT! Love the interior and the first one I see where the sleeping loft isn’t on top of the kitchen! Great idea! That’s how I keep telling my friend I want mine to be. I don’t like the outside but everything inside is perfect! Congrats! 🙂 Love all the skylights. Absolutely gorgeous!!! Beautiful mix of light and dark colors, and LOVE the skylights. What is behind the closed door over the bathroom entryway? For me there is way to much kitchen. I would rather have more space to hang out. I “cook” one meal a day. I think that much kitchen is such a waste of space. Other then that it is lovely. I love the walls and the lovely trim. 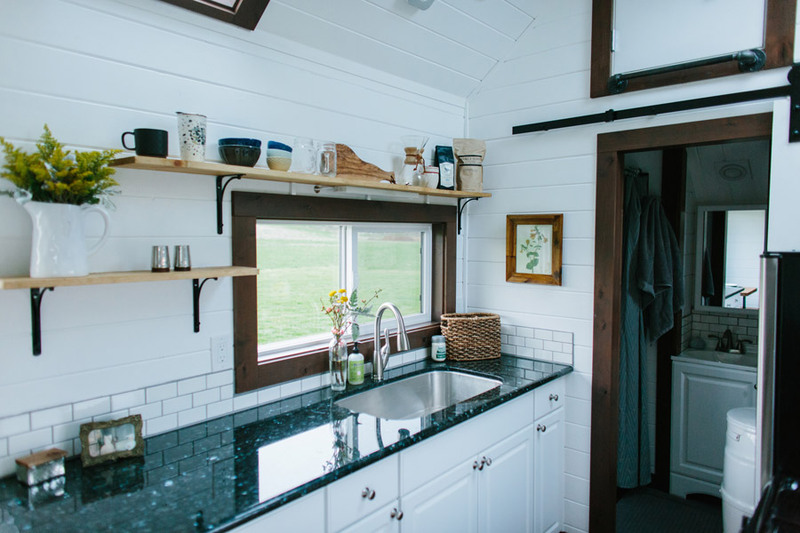 It is just so light and bright and airy for a tiny home. Beautiful. Def wouldn’t be a downgrade. Oh and that dinette is possibly the best looking dinette ever!! I’m in agreement on the kitchen. For me a two element stove top and a microwave convection oven would do the trick. Love the dinette and the finishes though. This is such a lovely, little home, and seems so much more cozy yet roomy with the use of the white colors and texture. I imagine this would be the perfect nest for one or even a couple. 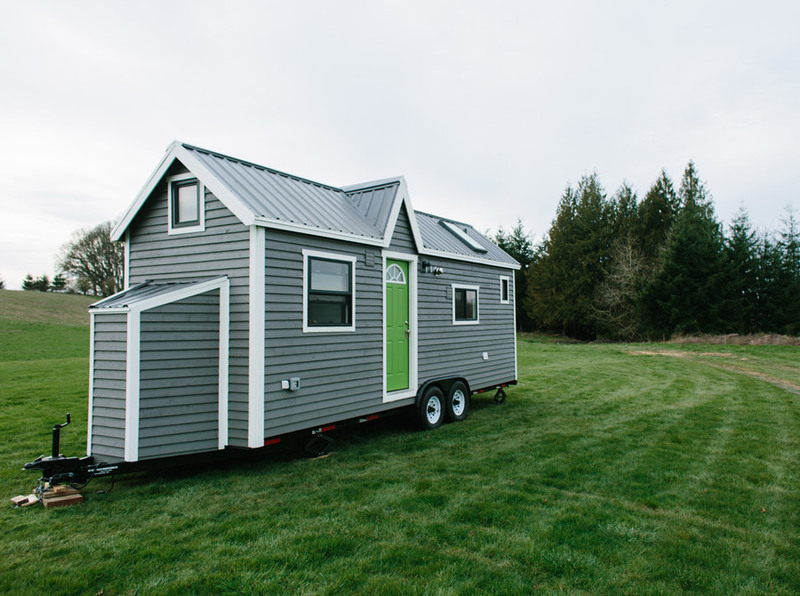 So glad to have found and now follow along with tinyhouseswoon where I can get an up close look at these tiny cuties. Thanks for sharing! You guys always do a wonderful job. Keep up the great work! Love it. For as big as this kitchen is, there isn’t really any space to store non-refrigerated food products. I think those two big windows take up too much space. I’d put eyebrow windows all around the top under the eaves and maybe one smaller casement windows on either side wall. 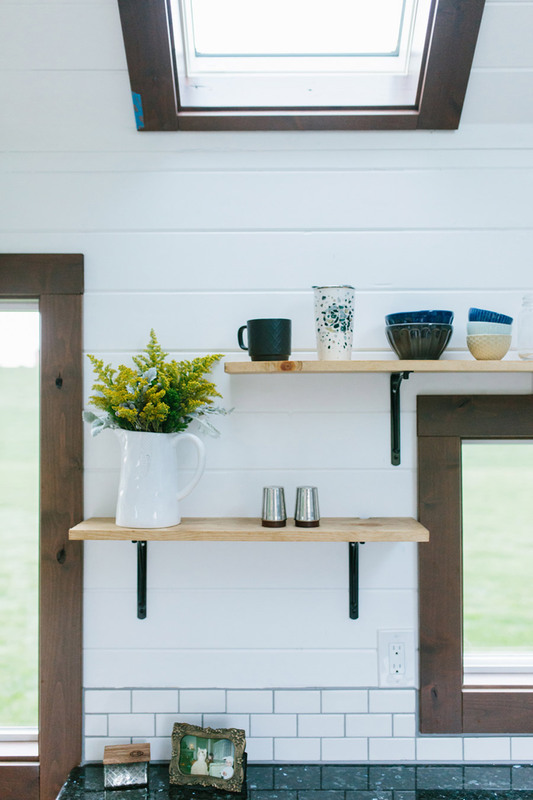 This would allow for cabinetry to store cereals and canned goods. I too am not a person who cooks a lot; this would be great for someone who truly enjoys the kitchen. I’d rather have a smaller kitchen and a convertible sofa to sit on with a desk for a laptop and a place to store business papers. But on whole, this is a very nice build; very attractive and for the right person a real gem! There are 6 lower cabinets of varying sizes. I’m not sure why you think there’s no room for non-perishables. I really love that they have put the bathroom all across the back. One thing that always has puzzled me is why design it so there’s a tiny bathroom in half of the house and then squeeze in a tiny kitchen beside it. It seems visually closed in and tight. This way is much more my style. I love the big windows, though I do agree with other comments that the kitchen does take up a lot of the living space. But perhaps these folks use the outdoors for more living space, and they enjoy cooking. We all have different needs and desires! I also didn’t see where they stored the ladder to get to the loft. I might have put the two closets outside the living space at the entrance to the bathroom, too; i.e. reversing their current placement. Nice and open looking! wpw. this would be the best little home in the world…..great space to relax, and great space to cook up a roast dinner. The colours used are easy on the eye and I could imagine enjoying the sitting room though I would love the have a well padded bench which could be converted into a bed so that I wouldn’t have to climb up to bed. The outside room has some decent space to it too which would give a bit more storage. Really nice, I love the skylights and all the light coming in. This is a very young(2014) New company with very slick marketing & highly staged model shots of homes with mostly white washed interiors that have never been lived in. 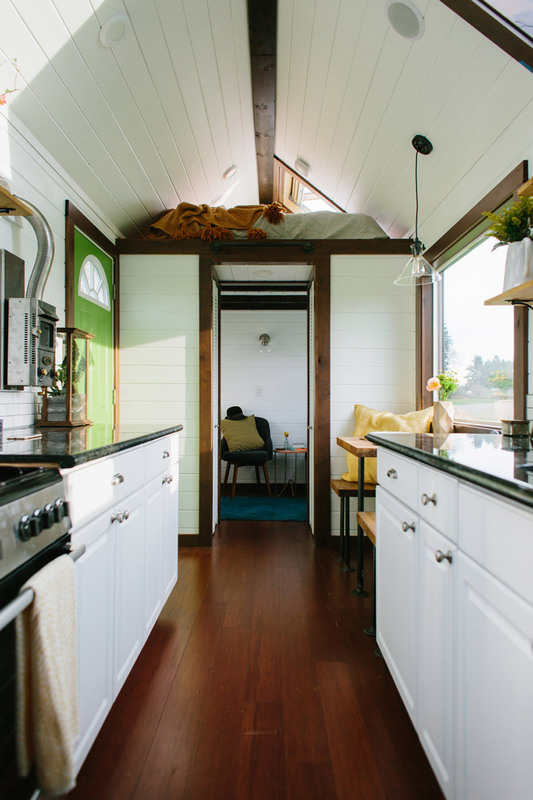 Their FAQ wrongly states – “We are the very first luxury, custom tiny home manufacturer in the US. we can honestly and confidently call the best and most quality tiny home in the world.” As a new company with a number of very young people who they say has a combined build experience of only 10 yrs that is quite a bold incorrect statement to say that they are “the very first luxury, custom tiny home manufacturer in the US” when there have been a number of tiny house builders going back way before any of them ever did any building & even before they were born! 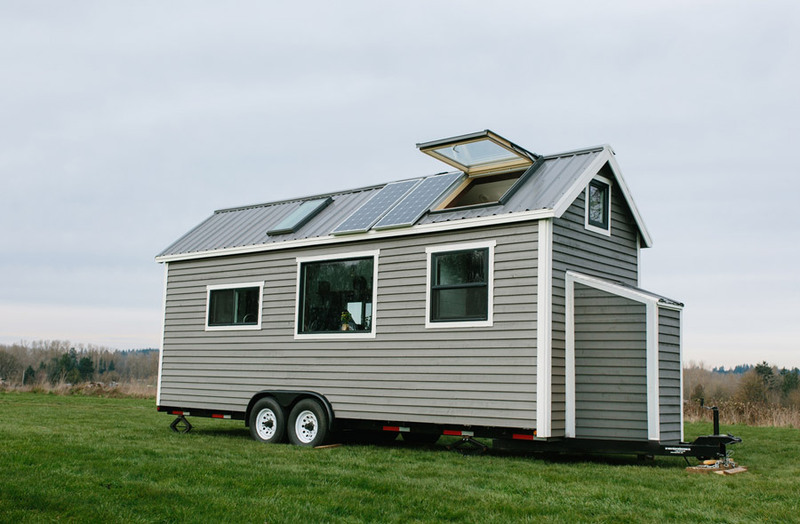 Their tiny houses Are Not Luxury builds any more than the top models of older more experienced tiny house builders are “Luxury”. And every builder customizes their build so to claim anything special about that is not being honest about their builds. – They steer you towards very expensive high markup extras in order to push the overpriced cost above $80,000+(their basic $75K plus expensive extra’s). WOW ! So negative. Tiny is a positive movement about “choice”, live and let live ! Very nice! Pretty and practical. Love the white walls with stained trim, and it is so very organized, especially the front entrance. Great idea! I’m in love! I would probably put a small loveseat or padded bench where chairs are with the table that can fold down . Otherwise, perfection! What is the sq ft and bed size displayed in this model? 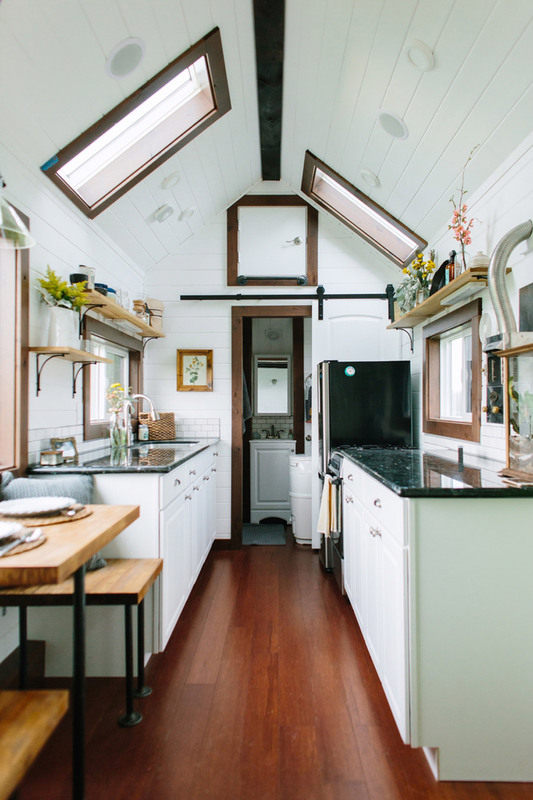 This is a beautiful tiny house and I love the use of skylights and colors used for the materials, it really gives a fresh, clean look. My fiancé and I are looking more and more into going “Tiny” & I am researching as much as possible to see what size and layout works best for us. This one is definitely on top of my list. We love the open kitchen and extra storage room above the bathroom. I think instead of a loft, we’d make that whole side of the house a bed that is on a frame with under-bed storage drawers. We would entertain outside with a fire pit and some lounge chairs, so no need for the sitting area (we’d just use the dinette). I mean how could you possibly sleep in that space? Or even get into it? !